As you know, every language has its own collection of wise sayings. They offer advice about how to live and also transfer some underlying ideas, principles and values of a given culture / society. These sayings are called "idioms" - or proverbs if they are longer. These combinations of words have (rarely complete sentences) a "figurative meaning"and they basically work with "pictures". 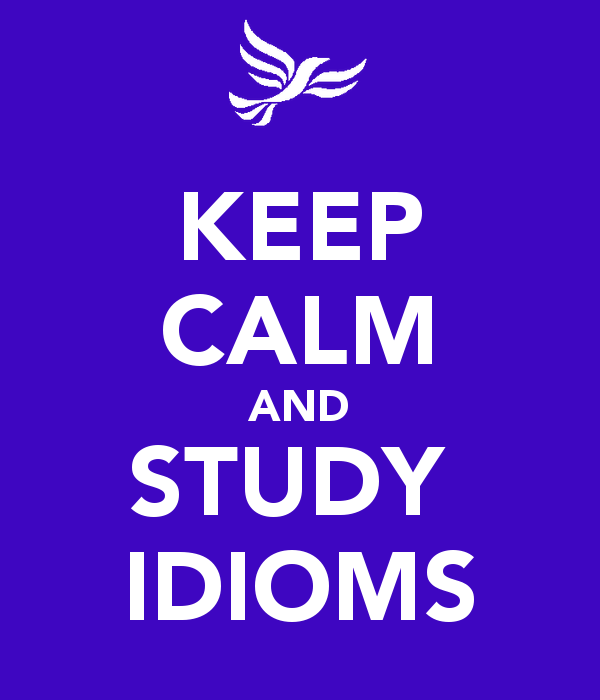 A good List of commonly used idioms and sayings (in everyday conversational English), can help to speak English fluently by learning English idiomatic expressions. This is the list we studied in 2007 - 2008. 1. THE ICING ON THE CAKE. If something is referred to as the icing on the cake, it is an extra benefit that makes a good situation even better. It is something good that is added to another good thing. Example: Good news! I've got the job ... and the icing on the cake is that I will get a company car too. To go Dutch with somebody means to share the cost of something, such as a meal or a concert. Each person in a pair or a group pays for himself or herself. To pay one's own expenses on a date or outing. Example: Young people today tend to go Dutch when they go out together. 3. TO HAVE A SOFT SPOT FOR SOMEONE OR SOMETHING. If you have a soft spot for someone or something, you particularly like them. Example : My grandfather had a soft spot for antique cars. A catch 22 situation refers to a frustrating situation where you need to do one thing before doing a second, and you cannot do the second before doing the first. Example: I can't get a job without a work permit, and I can't get a work permit without a job. It's a catch 22 situation! 5. AS GOOD AS A CHOCOLATE TEAPOT. Something that is as good as a chocolate teapot is not useful at all. Example: Your brother is coming to help us repair the computer !! Well, he's as much use as a chocolate teapot. He doesn't know anything about I.T. 6. A PAIN IN THE NECK. To refer to a person as a pain in the neck means that you think they are very irritating or annoying. Example: My boss shouts at me all the time, he's always complaining and never satisfied. He's a real pain in the neck. Sometime we just use the expression : He's a pain! 7. TO TWIST SOMEONE'S ARM. If you twist someone's arm, you put pressure on them to try to make them do what you want them to do. Example: My girlfriend didn't really want to go to the cinema but I twisted her arm. 8. TO HAVE A CHIP ON YOUR SHOULDER. To have a tendency to be easily angered or upset. Example: He lost his game this morning, and now he has a chip on his shoulder. 9. TWO PEAS IN A POD. To say that two people are like two peas in a pod means that they are very similar in appearance. They are two of a kind. Example : It wasn't difficult to identify the brothers - they were like two peas in a pod! 10. TO HAVE A GREEN THUMB. It means to have a talent for gardening, the ability to make things grow easily. A proclivity for successfully growing plant life. Example : My neighbour has a green thumb and she is able to grow one of the best gardens in our neighbourhood. 11. TO ADD FUEL TO THE FIRE. You add fuel to the fire when you do something that makes a bad situation worse. Adding "fuel" (such as wood or gas) to a burning "fire" makes the flames burn even higher and brighter. Sometimes you get involved because you want to help, but your involvement only makes the problem worse, adding fuel to the fire. Example: Please don't talk to him when he's in a bad mood. It just adds fuel to the fire. It is something that you say in order to tell someone who is annoying you to go away. It means go away and stop bothering me. Example : Go fly a kite! It's just not funny any more. 13. A FLASH IN THE PAN. It is used for a success that lasts for a short time and is not repeated. Someone or something that draws a lot of attention for a very brief time. Example: It seems that her latest success is just a flash in the pan. 14. IT SELLS LIKE HOT CAKES. If things are selling like hot cakes, people are buying a lot of them very fast. To be a great commercial success. Example: The new Harry Potter book has only just been published and copies are already selling like hot cakes in both Britain and America. 15. TO BE UNDER THE WEATHER. To say that someone is "under the weather" is to say that they are not feeling very well. Not healthy. It reminds us that a quick change in the weather can affect our health and the way we feel. The same term is sometimes used as a euphemism for being drunk. Example: I'm a bit under the weather. I don't think I'll be able to go to work.